What Is Beijing Doing to Prepare for the Military Parade? From subway shut-downs to trained monkeys, the city is doing everything to make sure the parade is flawless. To prepare for China’s military parade on September 3, Beijing will shut down some of its subway stops on Line 1 and 2 from late September 2 through September 3, Xinhua reported today. That’s just the latest announcement in a litany of inconveniences for Beijing residents, all to make sure China’s celebration of the 70th anniversary of the end of World War II goes off without a hitch. Existing traffic restrictions had already made Beijing’s subway even more crowded than usual. The number of subway passengers in Beijing jumped 10 percent once car traffic restrictions were put in place. The rules, in effect from August 20 to September 3, ban cars from driving on specific days, depending on whether their license plates end in odd or even numbers. It’s a customary practice to reduce car emissions when Beijing is trying hard to make sure skies will be blue for a special event. Also in hopes of creating “parade blue” on September 3, more than 10,000 factories are operating under restrictions or have been shut down entirely, The Nanfang reported, citing Beijing’s deputy mayor, Zhang Gong. Zhang said the restrictions will help reduce air pollution emissions by 40 percent in Beijing. The restrictions don’t only apply to Beijing either; nearby provinces Hebei, Tianjin, Shanxi, Inner Mongolia, Shandong, and Henan will also slow down industry and construction work to ensure clear skies. Other restrictions are being implemented out of security, not environmental, concerns. There will be a “no-fly zone” in effect over Beijing from 9:30 am to 12:30 pm on the day of the parade – meaning no flights will enter or leave Beijing during that time. The city will also ban drone flights on September 3, and has already restricted drone sales in preparation. Even birds are being grounded. Beijing’s government has banned domesticated pigeons from flying on September. Trained falcons will help protect the jets taking part in the parade by hovering in the air to scare off other birds. China’s Air Force has also trained macaque monkeys to demolish bird nests near planned flight routes. 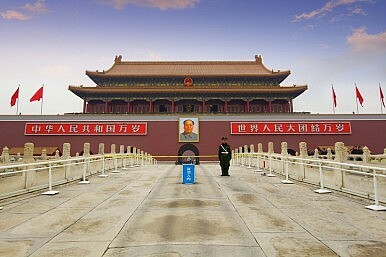 As another security precaution, Tiananmen Square has been closed to visitors throughout August, and will only reopen on September 7. Chinese media also announced that Beijing would add “an explosion-proof layer” to Chang’an Avenue, which through the city center and along Tiananmen Square. The extra precautions are being taken because Beijing’s Line 1 subway track runs underneath the street. Hotels in the area are not taking guests aside from those affiliated with the parade, reports the New York Times. Hospitals are closing down outpatient services and office buildings have been told to get rid of any sharp objects (including scissors). Those (un)lucky enough to live nearby won’t be able to catch the show – they’ve been told not to look out their windows during the parade. Beijing is even implementing strict restrictions on mail, saying that every package to enter the city must undergo security checks and be signed for upon delivery. Why all the precautions? China has been hyping the parade for weeks now, and places a great deal of importance on it going off without a hitch. The parade will include 12,000 soldiers and roughly 500 pieces of military equipment, many of which have never been publicly displayed before. Around 1,000 foreign troops from 17 countries will march in the parade as well. The parade will be attended by 30 heads of states and high-level representatives from an additional 19 countries.